is coated. Place on ungreased baking sheet. Using small metal spatula, shape into 10-inch circle with slightly raised 1-inch border around the edge. 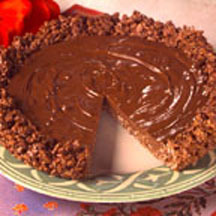 Pour remaining melted chocolate mixture in center of circle; spread to 1-inch from the edge. Refrigerate for 30 minutes or until firm.